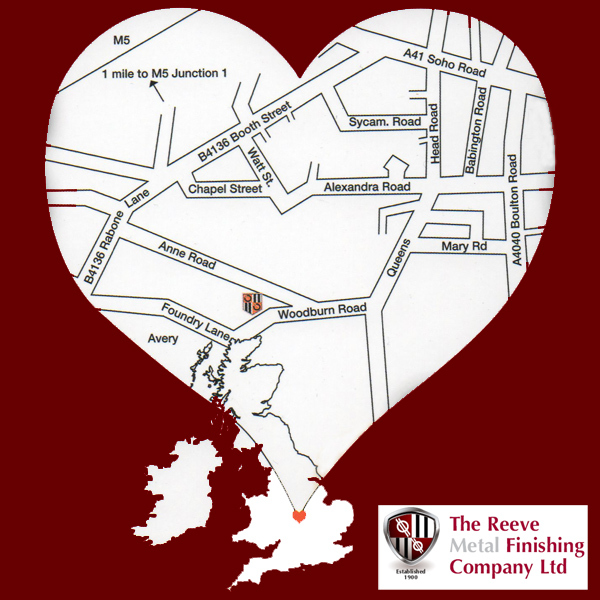 Welcome to The Reeve Metal Finishing Company Ltd - Tel: 0121 558 0692 .:| Contact Us |:. Your business is very important to us and we will get back to you ASAP. What is Salt Spray Testing? Salt spray testing measures relative protective values and enables comparison of different finish formulations. What Are The Different Types Of Zinc Finish? There are 4 main classifications of electroplated zinc finishes, based on coating thickness and type of application with protection increasing in line with finish thickness increases - Type 1 (Zinc plated) for mild indoor applications, Type 2 (Zinc with coloured chromate coating), Type 3 (Zinc with colourless chromate coating), and Type 4 (Zinc with phosphate conversion coatings) for the most severe applications or exposure to harsh, high abrasion outdoor conditions.
.:| BACK TO TOP |:. Plating can be a lengthy process - thorough preparatory is vital but takes time. Turnaround times will vary by the nature of the job and workload we will pre-advise estimated timescales for all jobs undertaken. What pre- preparation work is required before items are sent to us for Chrome Plating or rechroming? We undertake all pre chroming preparation for you but request that you dismantle your item to its simplest form if possible and is free of paint. Anodising is a process to coat a metallic surface electrolytic ally with a protective or decorative oxide, by passing an electrical current through an acid electrolyte bath in which the aluminium is immersed. Anodising forms a protective layer of aluminium oxide with a much higher corrosion and abrasion resistance than aluminium. Some types of anodising can colour the metal and give a decorative and protective finish. What is anodised aluminium used for? Can metals other than aluminium be anodised? Anodising is solely a treatment for aluminium, so for example steel and stainless steel can't be anodised as this would dissolve the metal. Can previously anodised metal be re-anodised? The existing anodising can be stripped off and the metal re-anodised. The old anodising must be removed first otherwise this will reduce the layers of the metal causing an uneven look and altering dimensions when re-anodised. How should I maintain an anodised surface? Rinsing with mild soap and water, never abrasive or caustic cleaners restores the original appearance of the anodised , as the aluminium oxide layer formed during anodising makes usage wear & tear, virtually non-existent. Black, Dark Gun Metal Grey, Light Satin Silver or virtually any customised colours at additional cost and lead timescales. The length of time the aluminium is left in the dye tank determines final colour darkness. A shiny finish may be achieved by polishing the aluminium prior to anodisation. The chemical brightening takes place at the beginning of the anodising process. The aluminium is placed in a phosphoric nitrate bath at temperatures up to 105°C. This is done before colouring. The film thickness for the highest brightness between 5-7 microns, the thinner the film the brighter the reflective surface will be. Normal turnaround is about a week to ten days from receipt of your parts although some batches may take a few days longer whilst others may be turned around faster. The Plating process cannot be rushed as pre-preparation is key but may be time consuming depending on the condition of the metal to be plated. We will give an estimated turnaround time with your quotation, although on occasions these may vary once work commences. Do you offer pre estimates for chrome plating? We always offer a pre-estimate before commencing any project and if any additional works are required as the work is undertaken, due to extra labour costs, time required or materials, again we advise you for approval of additional work costs. Payment can be made by cash, cheque or pre-approved account after the first 3 transactions.